Ever since I’ve been going regularly to Naples, for the last decade or so, I’ve harboured an ambition to go to Punta Campanella, on the other side of the Bay. This is a nature resort at the very tip of the Sorrentine Peninsula, with fantastic views of Capri, Ischia and other islands: it’s absolutely beautiful, especially in good weather, as it was on the 23rd, when I finally got to make it there – in fact the weather was so good, I managed to get sunburn in December. 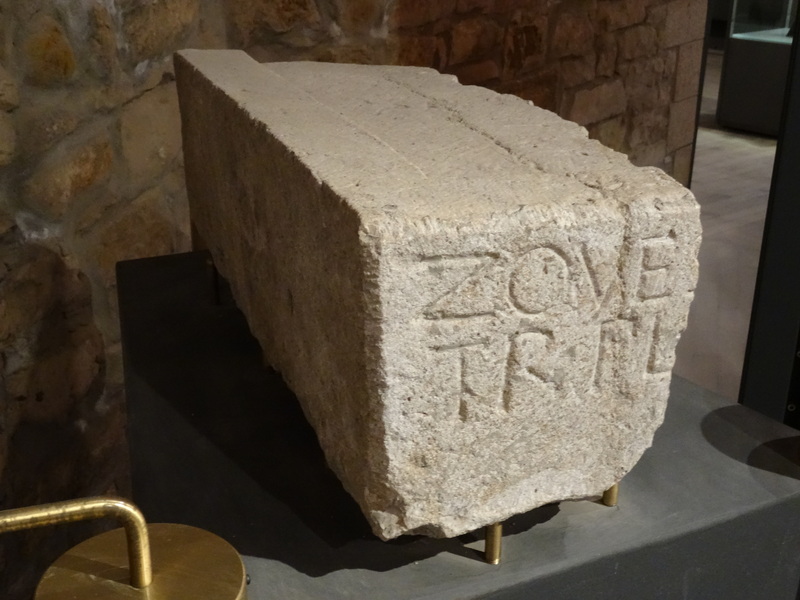 But I doubt that any readers of this blog will be surprised to hear that there was another incentive for me: an Oscan inscription waiting at the very end. Once upon a time there was a temple of Minerva on the hilltop. To reach it from the sea you disembarked at a cave far below and climbed a long and steep stairway between the walls of a narrow cleft in the cliff. The steps are still mostly serviceable, though they’ve crumbled away in parts; a little below where the steps enter the cleft, there is an inscription carved in the rock, recording the names of the magistrates of the temple who commissioned the building of the stairs (and including our only instance of the Oscan word esskazsiúm, which presumably means ‘stairs’ or ‘disembarcation point’). The inscription was published some decades ago, but the major editions have worked from photographs and/or the cast in Naples Museum (it’s Surrentum 1 in Imagines Italicae, ed. Crawford et al., Cm 2 in Sabellische Texte, ed. Rix). I’m not surprised, because getting there is quite a physical effort, and the inscription is very hard to see unless you’re right in front of it – which requires climbing on to a narrowish ledge, high enough to make one reluctant to fall! Photos below, starting from the sea. Thanks very much to Giovanni Di Maio and Donatella Guida for showing us the way. 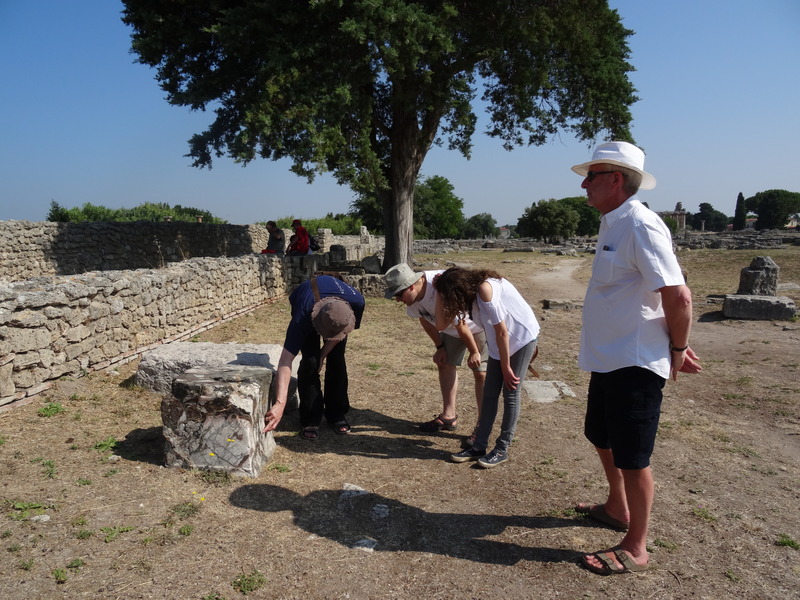 Categories: Epigraphy, Italy, Oscan, Research Trips, Sunburn | Permalink. 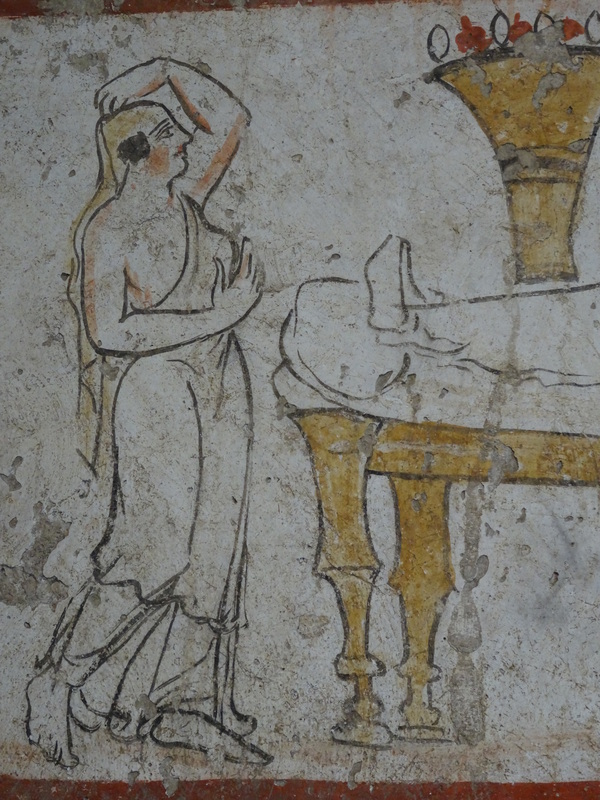 The epigraphic gallery of the Museo Archeologico Nazionale in Naples is now open! This is wildly exciting: when I went there in 2007, it was opened only on special application, and when I went in 2013 there was no electric light, and I had to examine the inscription I was interested in by the light of my own torch and a lamp obligingly held by a member of the Museum’s staff: there was certainly no possibility of looking at any of the other objects, as I had hoped. I’m extremely grateful to the Museum for kindly allowing and facilitating both my previous visits, but it must be said that it is much better now that one can just swan in and revel in all the epigraphy. I’ll post a few things from my latest visit in the coming weeks. 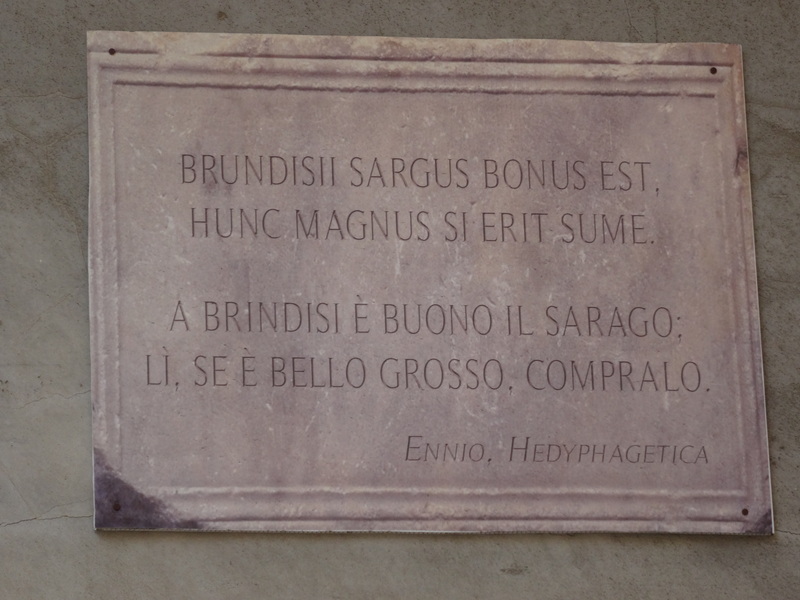 This time, I’ll focus on one inscription in particular, which is the rather nice column supporting a water basin (basin supplied separately) with an Oscan inscription which is published in Imagines Italicae as ma.heíis.de.me.v.ínim. me x.ekak.flit<e>am.emmens (Cumae 3/Cm 5) and translated as ‘Ma(is) Heiis, son of De(kis), meddix of the vereiia, and the X meddix (or the 10 medices) bought this flitea‘. A meddix is a type of magistrate. Apart from the fact that it’s not clear exactly what a me x is, especially as X is not a regular letter of the Oscan alphabet, the main problem is flit<e>am, which clearly has to be the name of the object on which the inscription is written. So far, the only semi-plausible suggestion is that it is somehow a borrowing of the Greek word πλινθεῖον /plintheion/ ‘brickwork’. There are a number of problems with this idea, though: a) it’s unlikely that Greek pl- would be borrowed into Oscan as fl-, which otherwise has no problem with the sequence pl-; b) we would probably expect the Greek sequence -εῖ- to be borrowed as Oscan –ei– or –í-; c) the Greek word is neuter, the Oscan one is feminine. And, actually, there is a further problem, which is that, according to Imagines, the fifth letter of flit<e>am is actually v on the stone (hence the pointy brackets). Now, as emendations go, e for v is really pretty reasonable: in the Oscan alphabet e is written E, while v is just an E without the middle horizontal stroke. 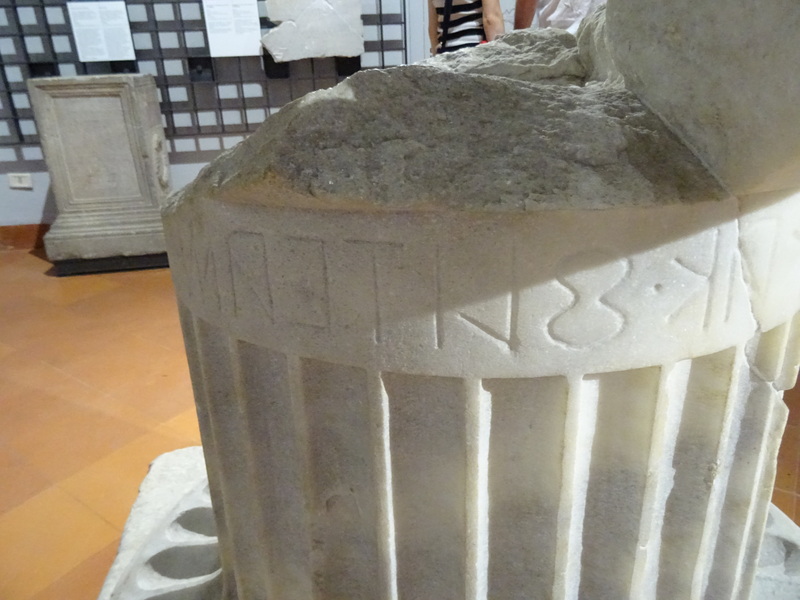 You can see the (other) instance of v, fourth letter from the right, in this inscription below (note that Oscan is written right to left). But, given the many problems we already have in connecting flit<e>am to πλινθεῖον, perhaps we should just give up the connection, and accept that we have a word flitvam whose origin is obscure, and at any rate is nothing like πλινθεῖον. So, is it really a flitvam? Well, I’m not sure. Rix, in his edition Sabellische Texte, prints an e with a dot under it. Unfortunately, in his edition, this dot means two different things: a damaged letter, or a letter conjectured from a broken or mistakenly written letter on the object. So it is not clear whether he sees a damaged e, or, like Imagines, a mistaken v which he replaces with e. There is definitely some kind of horizontal-ish stroke in the middle of the letter. It’s more or less visible in the photos below; in person, with a raking light, it looks deeper, firmer and more intentional. 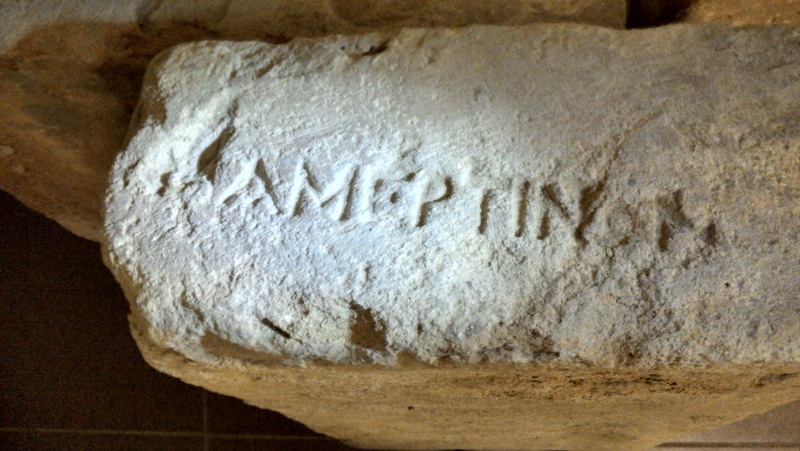 On the other hand, the object has clearly been damaged, and the stroke is less well-made than the other es in the inscription (you can see one as the second letter from the right in the picture above): it is not precisely parallel to the upper and lower horizontals, beginning rather low on the vertical and straggling diagonally upwards. At the moment I’m leaning towards seeing it as an e, but it just shows how much difficulty can be involved in reading even a clearly-written inscription. Categories: Campania, Epigraphy, Italy, Oscan, Research Trips | Permalink. Last week, I was lucky enough to present at the biannual Roman Archaeology Conference, held at La Sapienza in Rome in conjunction with the annual Theoretical Roman Archaeology Conference. Greg Woolf, of the Institute of Classical Studies, had asked me to be part of an interdisciplinary panel on ‘Replication and Standardisation in the Roman World’. The aim of this panel is to confront these issues of standardization, imitation, replications and mimesis acrosss range of phenomena not normally considered in parallel. Dr Van Oyen will consider the emergence and persistence of standardized forms of tableware, Professor Bevan the implications of the mass production of amphorae, Professor Trimble the appearance of standardized forms in statuary and Dr McDonald the impluses towards orthographic and epigraphic convergence in Latin and other Italian languages. All have already published important work in these area, but the cross-media encounter is genuinely new and one all participants are enthusiastic about. Greg Woolf will introduced the theme and our discussant and respondent will be Professor Alicia Jiménez whose work on hybridity and post-colonial approaches to Roman provincial culture has established a new benchmark for studies of this kind. As Greg put it in his introduction at the conference, this was a way of getting away from the idea of ‘Romanisation’, and towards a more interesting and nuanced view of why, how and what people in Roman Italy standardised. 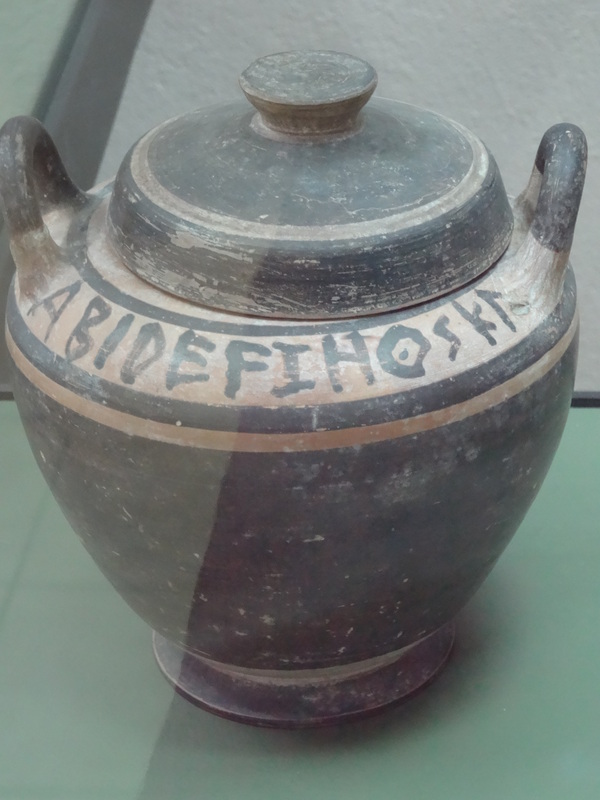 My linguistic angle on this ended up being on the standardisation of alphabets and orthography in Italy from 500-100 BC – if you’re interested you can take a look at my slides over here. Greg’s request for a paper on standardisation prompted new questions for me, particularly around whether it is ever possible to have enough evidence for standardisation in a fragmentary language. I also ended up considering whether the texts of ancient Italy have features that make them look ‘standardised’ or ‘consistent’ to us – is it a coincidence, for example, that the language with the least ‘consistent’ orthography to our eyes is Umbrian, which also gives us by far the longest epigraphic text from this period? I’m hoping to explore some of these issues in the coming term. Categories: Research Trips | Tags: #conferences, #travel | Permalink. 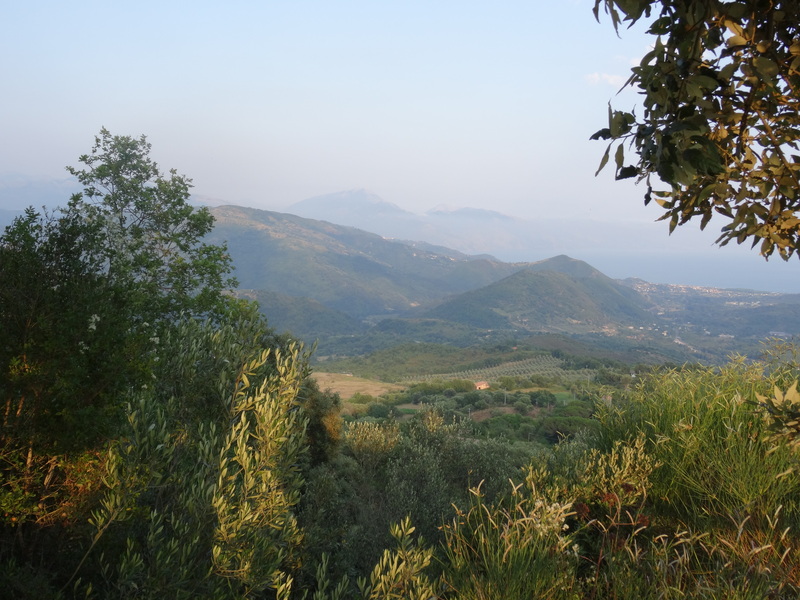 Last week was our second “Greek in Italy” project trip to the south of Italy. Like our last trip in September 2014, I’m sure that pictures and thoughts from this trip will keep bubbling up in my blog posts and articles for quite some time. But even though we’ve only just got back and I’ve not had time to go through all my notes and photos yet, I wanted to write a quick summary of what we did – partly to show off some great sites and museums which deserve more visitors, and partly to help remind myself later. 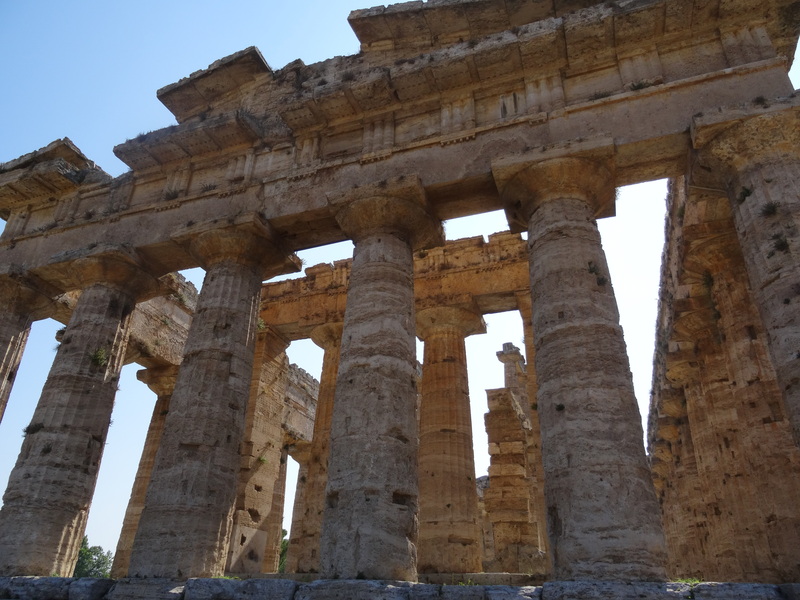 We started out in Paestum, which boasts some of Italy’s most beautiful and well-preserved Greek temples, dating from the sixth and fifth centuries BC. Today it’s a popular tourist sight, and rightly so. The temples are (mostly) not reconstructed – their amazing state of preservation made them a key sight of the Grand Tour. There are even some Early Modern engravings showing the temples all overgrown and disused. 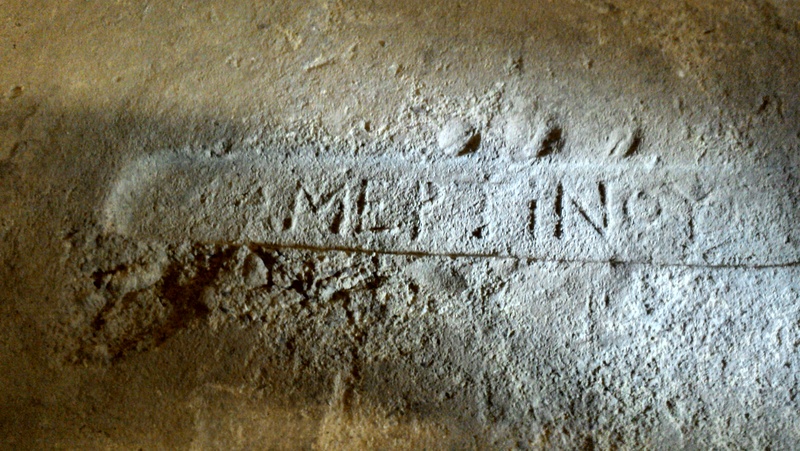 There were plenty of inscriptions around the site to keep us busy, mostly in Latin. 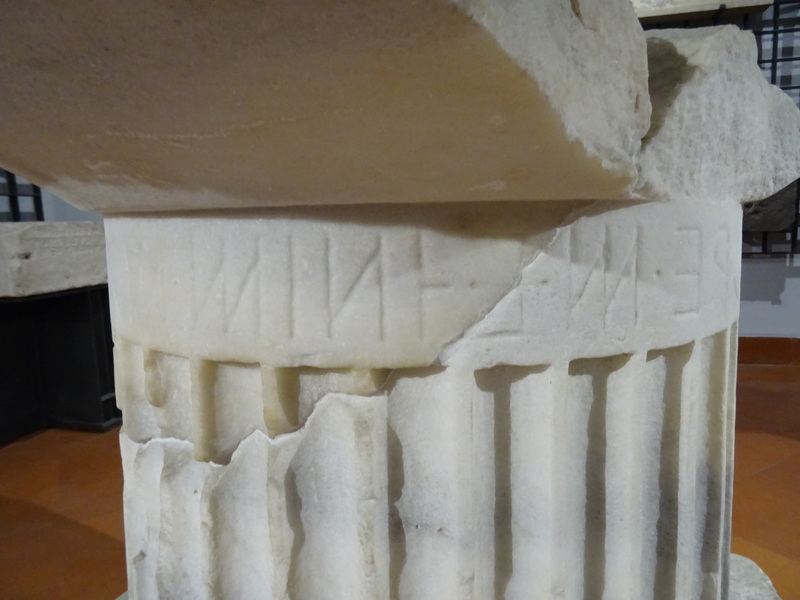 Inscriptions in Greek, Oscan and Latin have been discovered at Paestum, making it a very important site for research on ancient multilingualism in Campania and Lucania. We don’t know exactly which ancient region Paestum would have been in, since ancient authors aren’t always specific about borders: Paestum is in modern Campania, but is often considered to be part of ancient Lucania because of the use of Oscan in the Greek alphabet there. 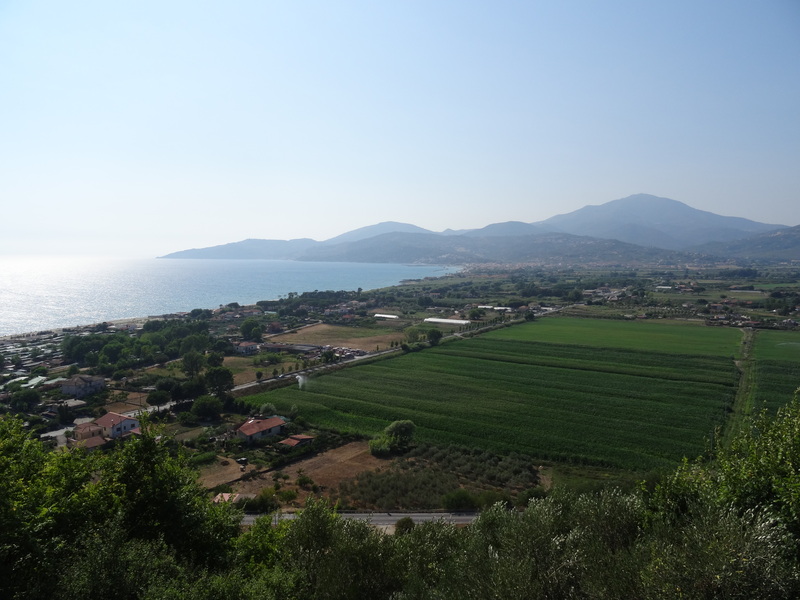 Next we traveled to Velia, also known in Greek as Elea, home of several famous pre-Socratic Greek philosophers, the Eleatics. One of the main attractions of the site for me was the view, which naturally made me feel very philosophical. We made sure to take some time to ponder whether change is impossible (as believed by Parmenides) and a couple of Zeno’s paradoxes on the way up the hill. 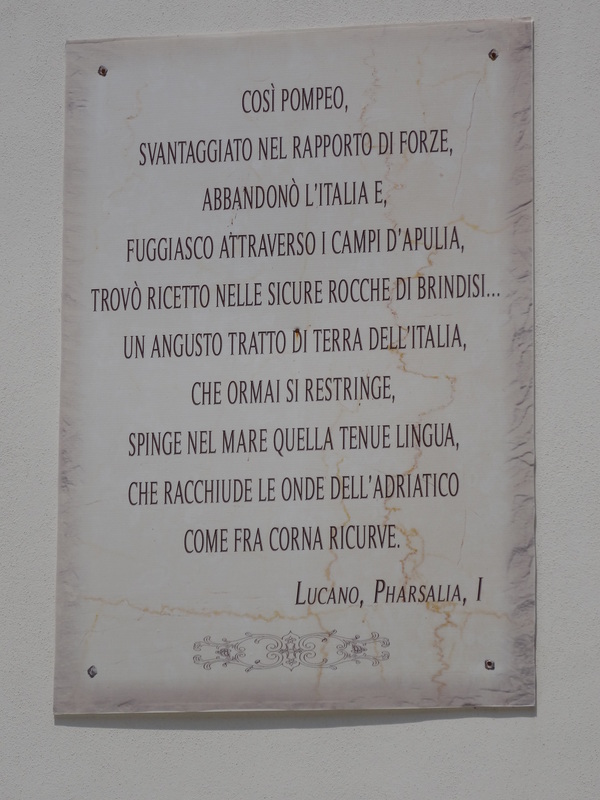 Next we travelled to Roccagloriosa – a non-Greek site whose original Oscan name isn’t recorded in any ancient source. It’s near the later Roman colony of Buxentum, but distinct from it. Again, the views were brilliant – I think the whole team was in agreement that Basilicata (ancient Lucania) has some of the best landscapes in Italy. You can just about see the sea to the right-hand side of the picture below – I’d never realised that the sea would be visible from Roccagloriosa at all, despite having read about it for several years. Roccagloriosa is a fascinating site, and despite its relative obscurity two important Oscan inscriptions have been found there. 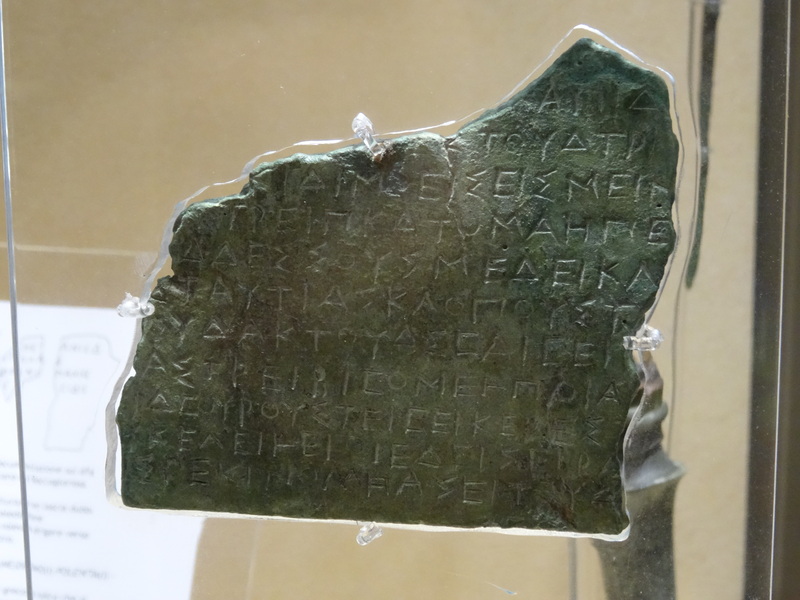 The longer text is a fragment of a bronze law, one of the earliest legal texts in Italy. Nick and I have written an article on this text, so it was great to see it in person again. 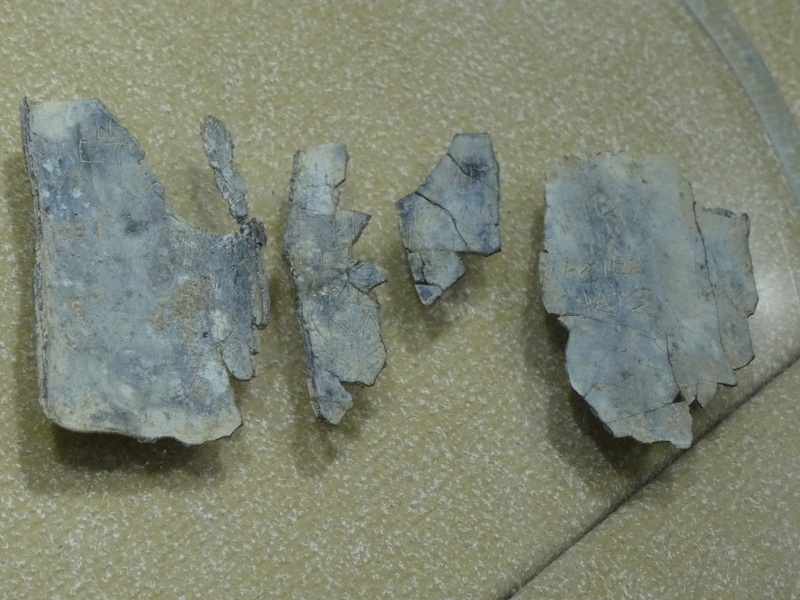 Excavators also found a piece of lead which bears both a commercial text in Greek (probably some kind of receipt) and a curse in Oscan. The photo below is a close-up in which you can just about see the small letters scratched on the lead. 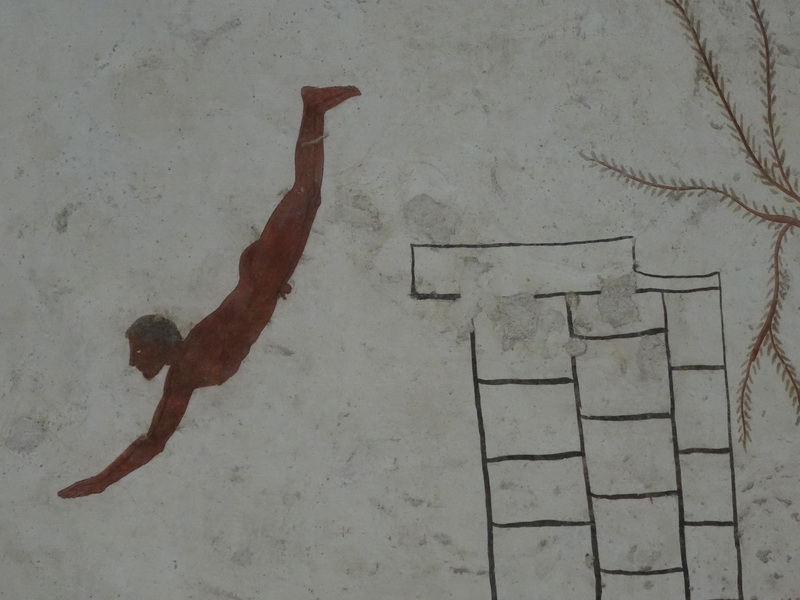 The next day, we returned to Paestum to visit the museum. 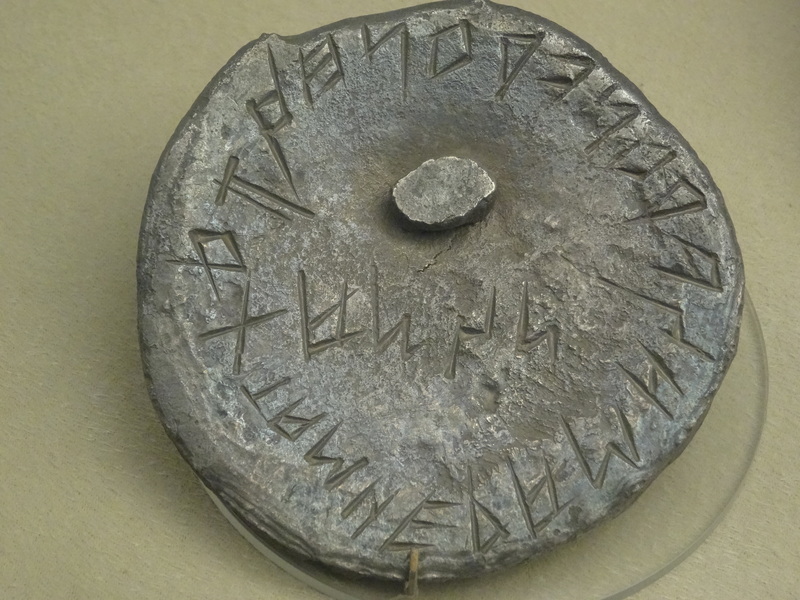 This silver disc with an obscure inscription in the Achaean alphabet attracted our attention. Even though it’s very clear indeed, it’s still not well understood. We’re not even sure what a couple of the letters are supposed to be (any suggestions for the letter on the left which looks like a tau with two legs?). 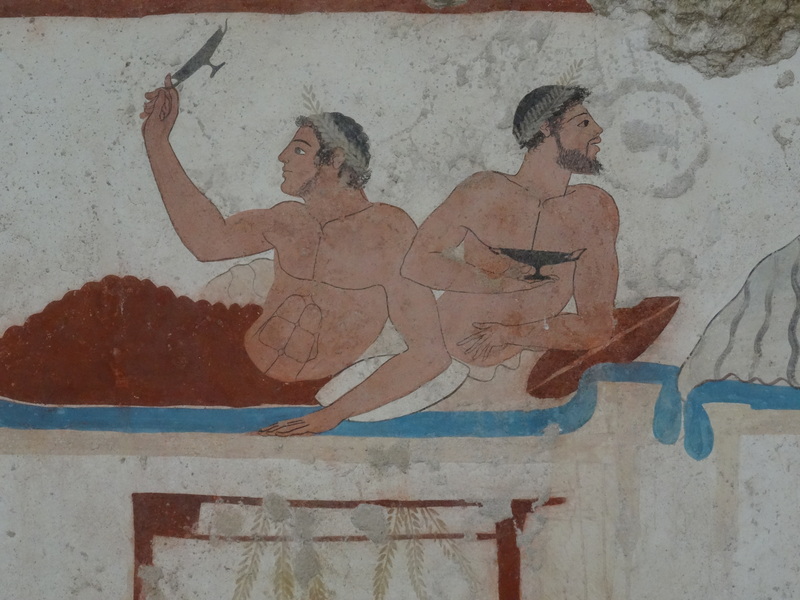 Of course we also had to visit Paestum’s fantastic tomb paintings. In general art history seems to prefer the paintings from the “Greek” era of the town, but we also have a fondness for the later “Lucanian” paintings. 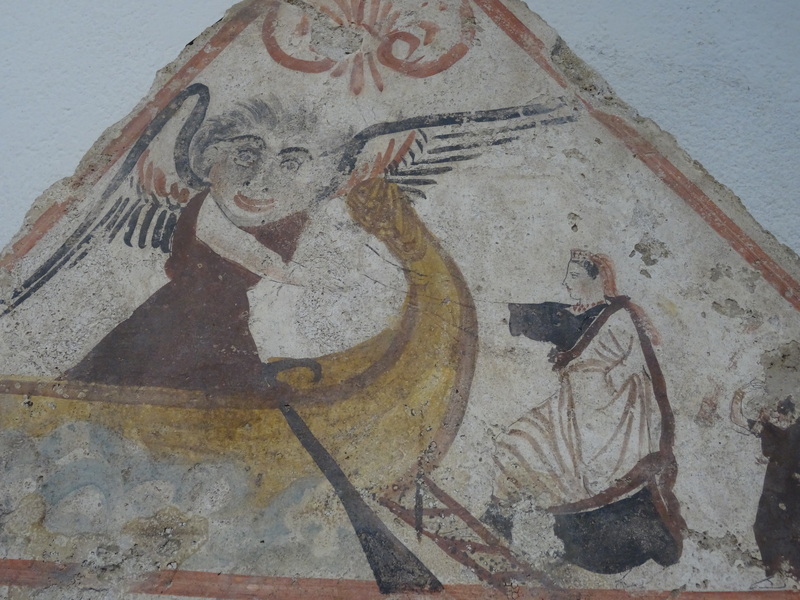 Most of these show gladiators stabbing each other, but there are also some evocative scenes of funerals and the afterlife, including a demon welcoming a woman’s soul into a boat to the underworld. 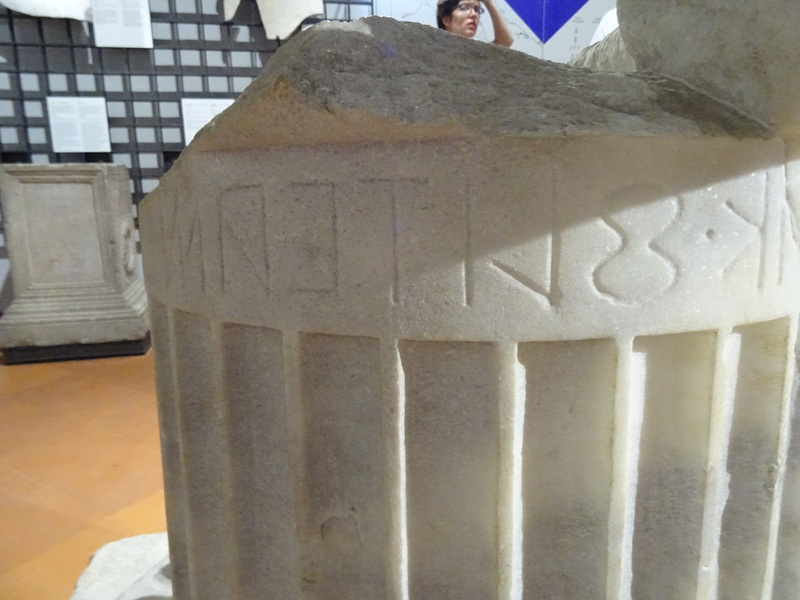 We then travelled to Metaponto, where we found this great early example of the Achaean Greek alphabet. By the time we got to Metaponto it was 41 degrees, and even the Italians were wilting a little. Moving on to Puglia the next day, we travelled to Brindisi. Ancient Brundisium was at the very end of the Appian Way, the main road south from Rome. 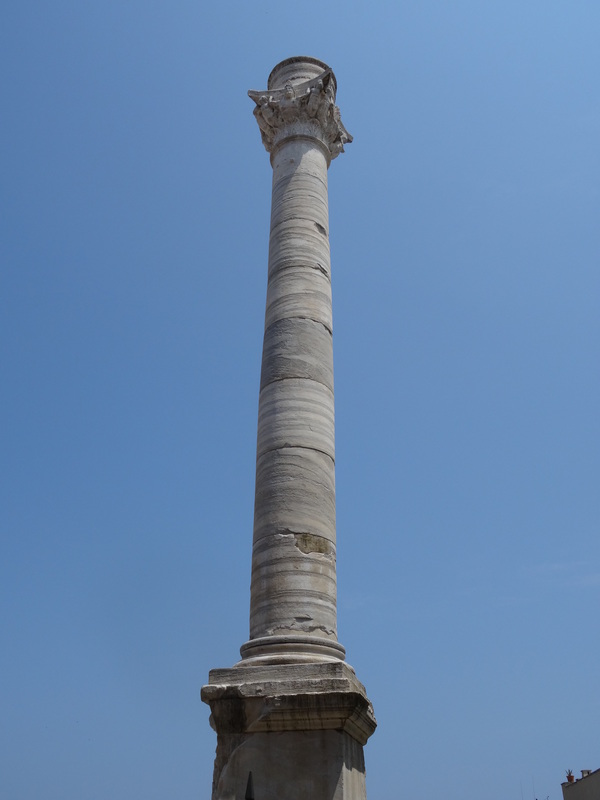 This is the column which marked the end of the ancient road. I’ve seen quite a bit of the Appian way this year in Rome and Capua, so it was great to feel like I’d finally completed that journey. 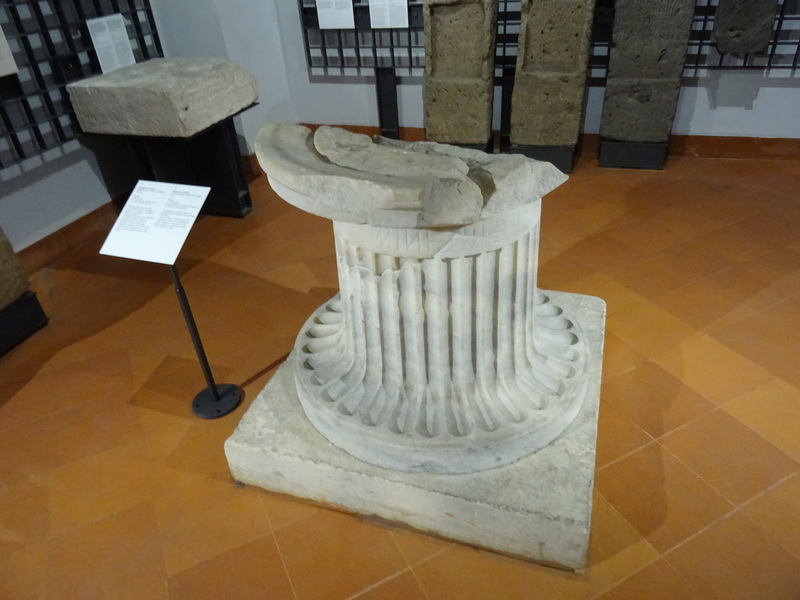 Brindisi has an extensive epigraphic collection in its museum, which kept us busy looking at many interesting borrowings and contact effects between Greek and Latin. 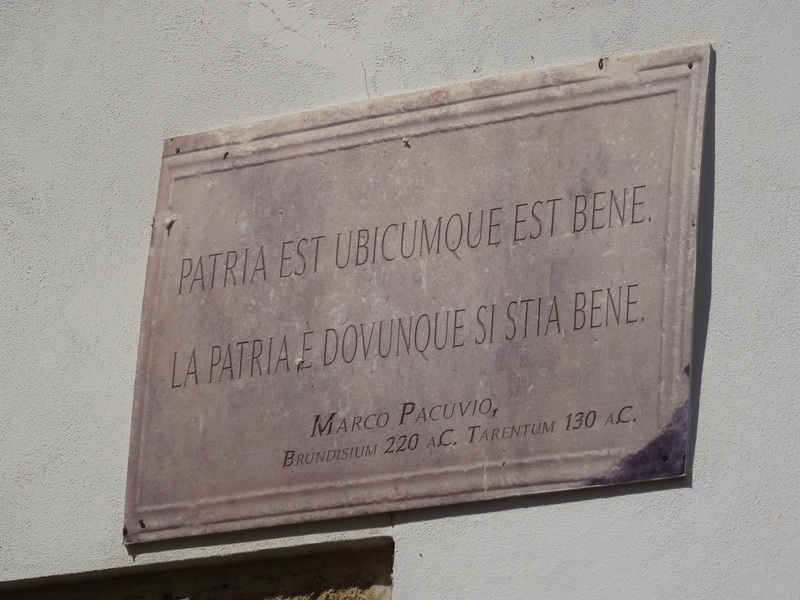 Brindisi also takes its strong Classical heritage pretty seriously, since many early Latin authors including Pacuvius, Ennius and Livius Andronicus were from Brundisium, Tarentum and the surrounding area. Though the Ennius quote they’ve displayed was perhaps not the most exciting one they could have found. 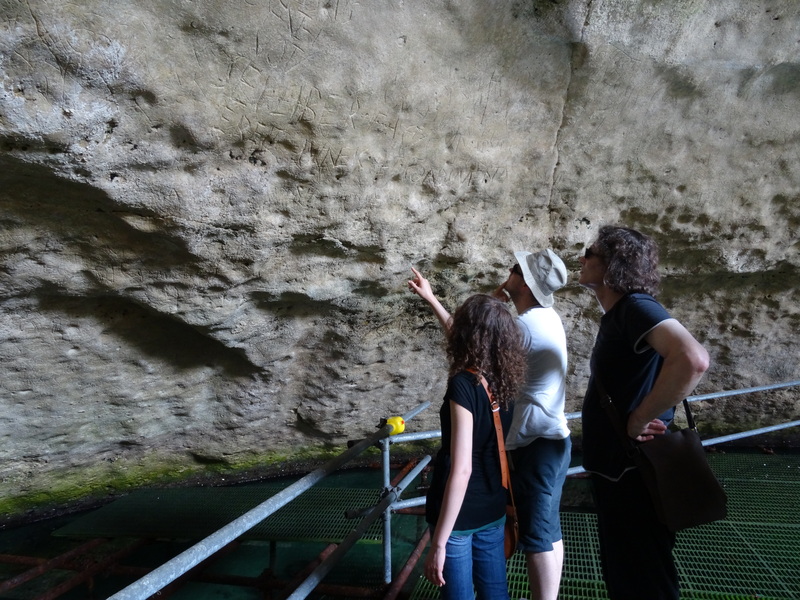 On the Thursday, we went to the Grotta della Poesia in Roca, near Otranto, where we were shown around by Dott.ssa Mazzotta of the University of Salento. 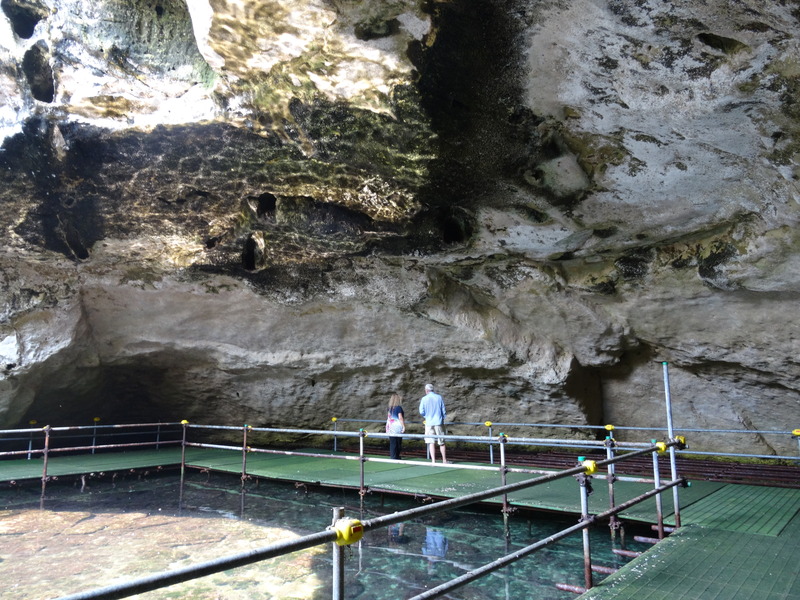 This was not only a beautiful beach resort, but also an incredible source of Messapic, Greek and Latin inscriptions, all hidden away in a huge cave. Before we arrived, we had no idea just how many inscriptions there were – but it turned out that the entire cave is covered in writing, which often overlaps and covers previous generations’ messages. We’d like to thank the British School at Rome for helping us set up this visit. Since we were in the area, we also swung by the town of Calimera (Greek for “good morning”), which is one of the few towns in Italy where Greek is still spoken, in the form of the dialect Griko. We were rewarded by several signs and posters written partly in Griko, which our resident Greek speaker had a go at translating for us. On our final day, we visited Canosa and Venosa on our way back to Naples. Canosa has a very interesting Daunian history, which we all know relatively little about, as well as some evidence of a Greek presense there. 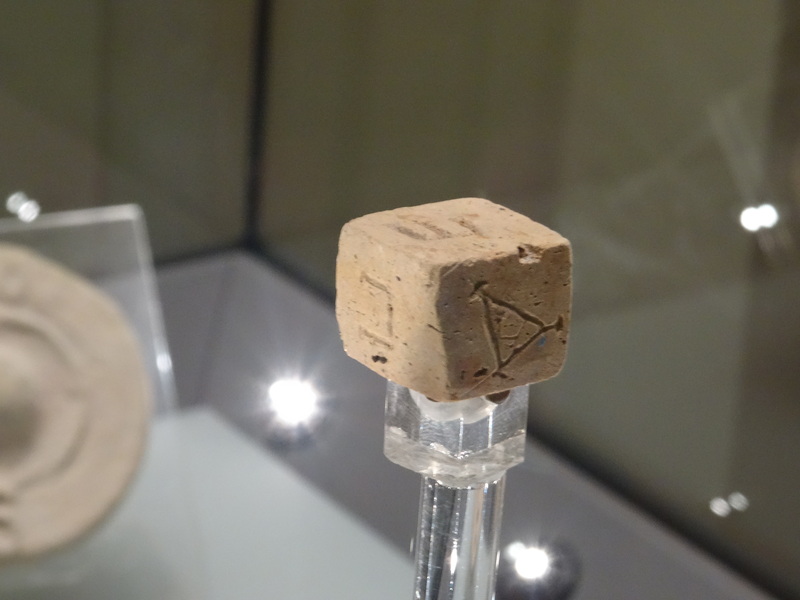 I was quite taken with this dice marked with the first six Greek letters instead of numbers or dots (note the digamma on the left hand side for the sixth letter). Venosa was a Roman colony, called Venusia, but the museum there also includes some Oscan and Latin material from the nearby town of Bantia. This block is part of a dedication to Jupiter, written in Oscan in the Latin alphabet. Before we flew back to the UK at the end of the week, we also went round the touristy but very fun Naples Underground tour, where we saw remains of Greek and Roman cisterns, and the flats and hotels built into the ancient theatre – highly recommended if you’re visiting Naples. We also visited the Roman street preserved underneath the Chiesa di San Lorenzo nearby. It’s been a very valuable trip for me – there’s nothing quite like putting the inscriptions and literature I’m working on in their context, and getting to see the landscapes and towns where this writing was produced. 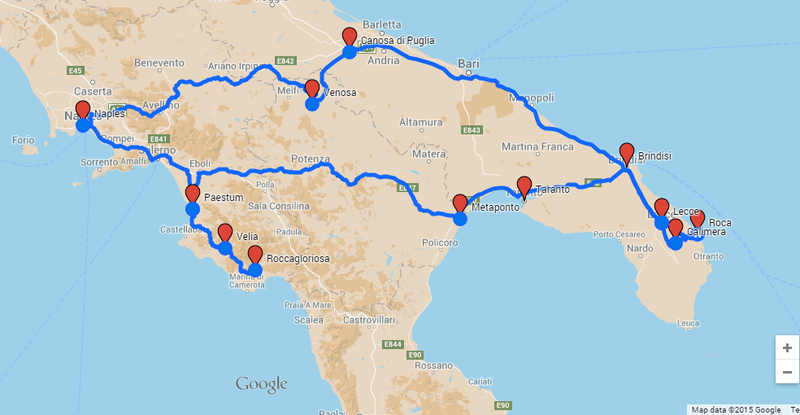 I feel very lucky to have taken not one but two trips to southern Italy with this project. 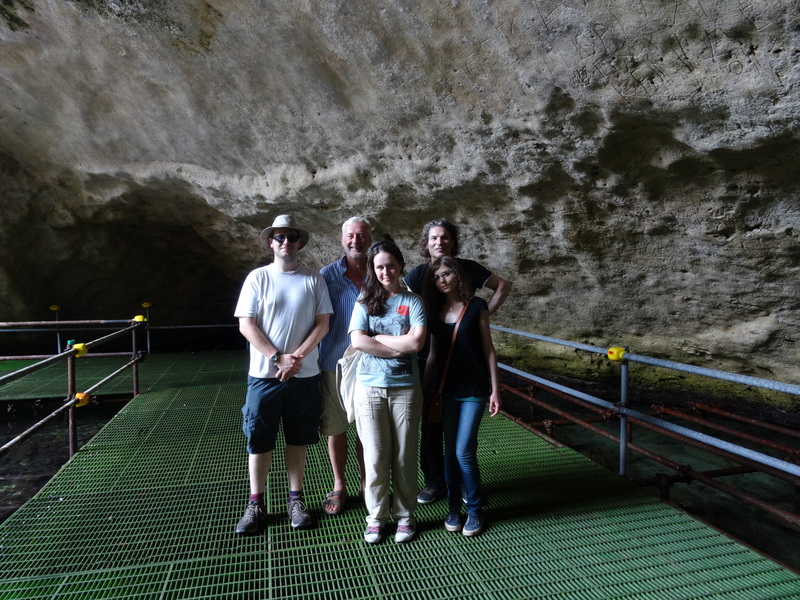 Here’s one last photo of the team at the Grotta della Poesia, looking hot but pleased with our discoveries. 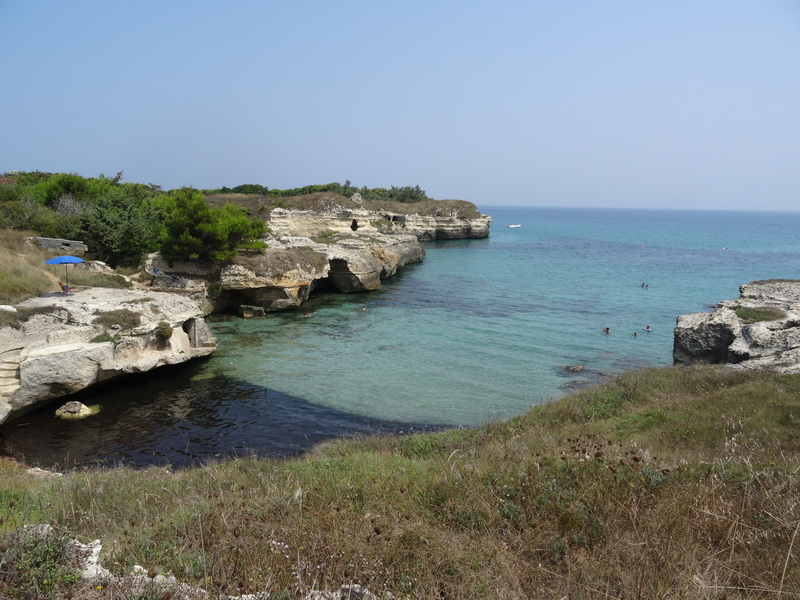 Categories: Basilicata, Campania, Greek, Latin, Messapic, Oscan, Project News, Puglia, Research Trips | Permalink. ‘Linguists just aren’t interested in tile stamps.’ I remember making that point years ago to Michael Crawford when collaborating on the Imagines Italicae project, and now my words come back to haunt me. It turns out that tile stamps, imprinted on wet clay during the manufacture of roof-tiles, can be more interesting —linguistically, epigraphically, and for social history—than I had imagined. On our recent trip to Calabria, the Greek in Italy project members spent quite a lot of time looking at tile stamps, most memorably in the deposito of the Museo Regionale Interdisciplinare di Messina (thanks to the extraordinary kindness of Dottore Agostino Giuliano and his colleagues, who gave up their Saturday morning to let us in and to show us around). The Messina collection includes Greek, Oscan and Latin tile stamps alongside each other, but most publications separate out the material into different languages. Seeing all the stamps together, it is not always easy at first glance to be sure which language they are in, particularly if the stamp is well-worn or broken. We spent an excited 15 minutes thinking that we had found a new tile stamp with Oscan written in the Greek alphabet, since it ended in the letter M. Greek words don’t end in M, but Oscan genitive plurals do, and one way of saying that the tile is the property of a particular community is to use a genitive plural—the name of the Mamertini, the mercenaries who captured the port of Messina at the beginning of the third century BCE, appear on tile stamps in the genitive plural, both in Greek (Μαμερτίνων), and in Oscan written in Greek (Μαμερτινουμ). But then Nick pointed out that we were reading the text upside down, and it was a familiar Greek text after all. Some of the other Greek tile stamps were also puzzling. One clearly reads ΡΗΠΙΝΟΝ ΟΡΘΟΝ – the first word can be corrected on the basis of other stamps to ΡΗΓΙΝΟΝ, i.e. 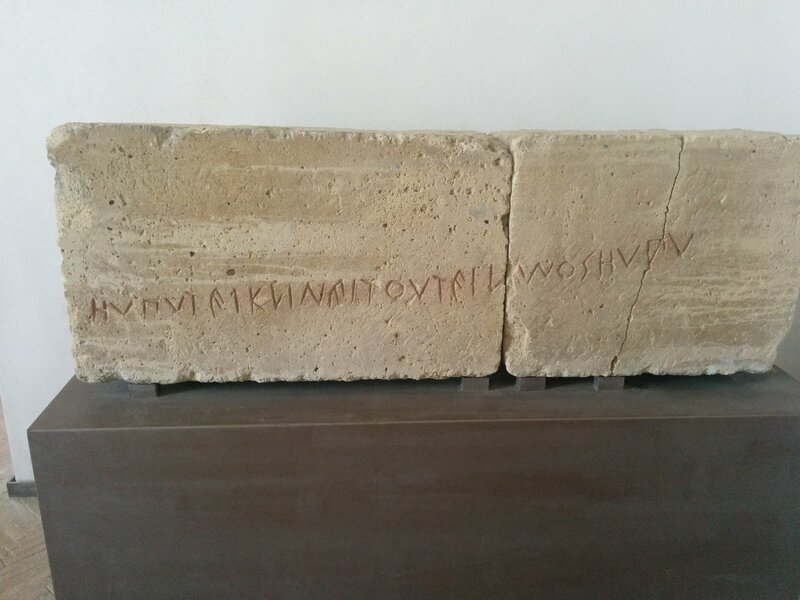 Ῥηγίνων ‘of the Rhegians’, showing that someone had got a tile from Rhegium (modern Reggio Calabria) on the other side of the straits of Messina, but what of the second word? At first sight this appears to mean the ‘true’ Rhegians, as opposed to outsiders or imposters, but the Greek word ὀρθός isn’t used of people without further specification like this, and it is probably better to think that this is the name, Orthon, of the tile manufacturer. What were tile stamps for, and who read them? It seems that stamps could have different audiences and functions. Latin tile stamps from Veleia and Oscan tile stamps from Bouianum, for example, include the name of magistrates, and Crawford argues that this is so that the purchaser of a tile would know its age, since a tile that had lasted over winter was more valuable. In other areas of the ancient world, stamps indicated that the tiles belong to a sanctuary or a public building. The marking of tiles with the genitive plural, as in ‘of the Rhegians’ or ‘of the Mamertini’ is limited (in Italy) to Greek texts from the south, and the only peoples of Italy who adopted this practice are the Mamertini and the Tauriani (whose bricks and tiles have been found in several areas just north of Reggio). So did the Mamertini abandon Oscan as they became Greek speakers, or did they start stamping in Greek and then switch to Oscan? Or was no one that much bothered about which language to use? Going to the trouble of making a stamp and marking tiles is unlikely to have been a trivial matter, and it seems to me that adopting the Greek alphabet and using the Greek style genitive plural shows that the Mamertini took a conscious decision to make the Greek practice their own. There is more to tile stamps than you might think. Categories: About Us, Alphabets, Calabria, Epigraphy, Greek, Italy, Languages, Oscan, Research Trips, Sicily | Permalink. As those of you who follow us on Twitter will know, the project has been in Italy this last week. Not because we fancied a holiday just before term starts again (although the weather was very nice indeed, and we did manage to have lunch on the beach at Nicotera Marina), but because part of the point of our project is to see the inscriptions we rely on for our work for ourselves. Even when an inscription is fully published, with good pictures and information about provenance, context and problems in the reading, it’s astounding what a difference it can make to see the object itself. All of a sudden you can discover that an apparently obvious stroke is caused by accidental damage rather than an intentional chisel, or that if you turn the object to catch the light differently an otherwise invisible indentation appears. On the other hand, it’s easy to get carried away when you see an inscription ‘in the flesh’. 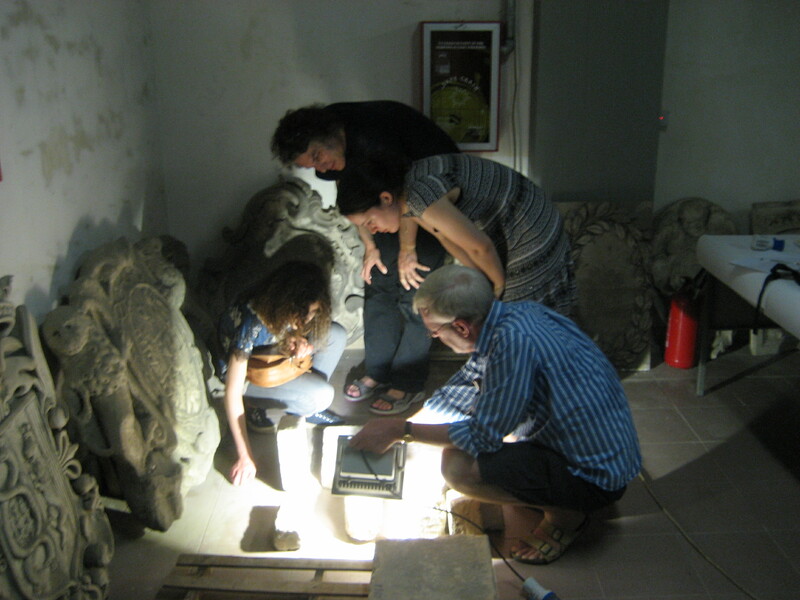 Here’s a picture of the team hard at work over an exciting new Oscan inscription. Shortly afterwards we realised we had it upside down and it was really Greek. On this trip we were predominantly looking at Oscan inscriptions, as both mine and Katherine’s books on Oscan are in the final stages. We found some pretty exciting new readings, which we’ll have to take account of (watch this space). 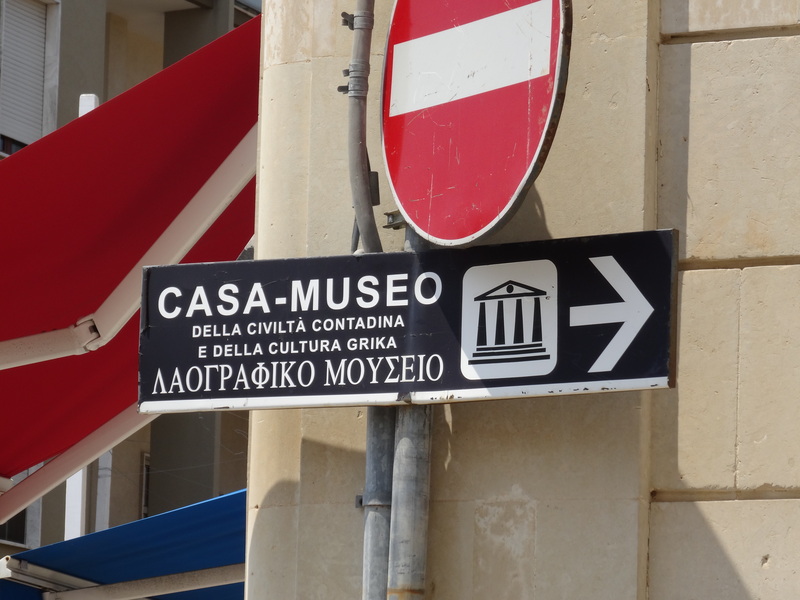 Among the museums we visited were the Musei Nazionali Archeologici of Crotone, Vibo Valentia and Reggio Calabria in Calabria, and the Museo Regionale Interdisciplinare in Messina, Sicily. We were overwhelmed by – and very grateful for – the helpfulness of the staff at all the museums, especially in finding things that we didn’t have inventory numbers for, letting us into the museum deposits, and giving up their time to help us out. Our limited edition project keyrings were but little recompense for their kindness. Planning for the next trip starts soon! 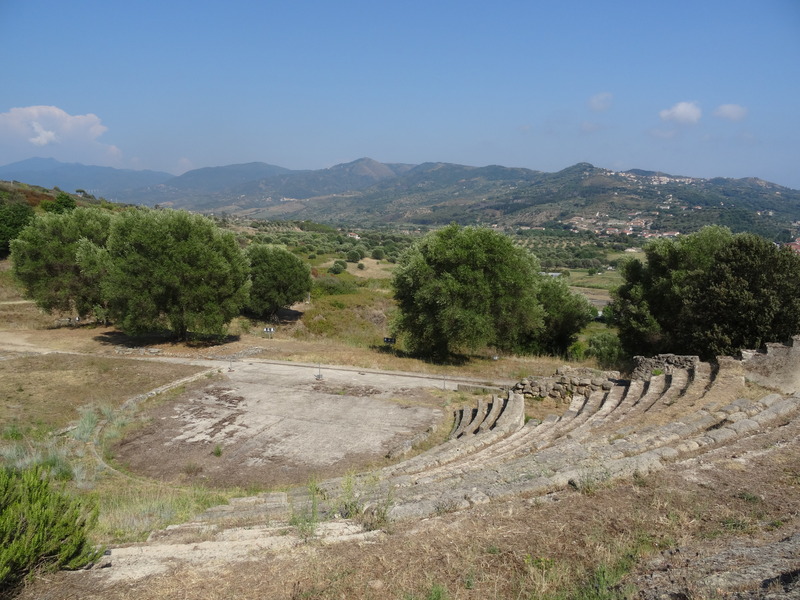 Categories: About Us, Calabria, Epigraphy, Oscan, Project News, Research Trips, Sicily | Permalink.